Can this slimline player deliver a weighty performance? With its black finish and improbably slim dimensions, the SD-370E is a hugely attractive DVD deck that perfectly compliments Toshiba's latest range of Regza LCD TVs and HD DVD players. The fascia is minimal, the illuminated power button is a nice touch and, despite being light as a feather, the deck is solidly made. At first glance the rear panel seems sparse, but it does offer all the sockets you need. The HDMI output, which squirts out video digitally in 576p, 720p or 1080i flavours, is the obvious highlight, and it's joined by component video output, an RGB-capable Scart plus digital and analogue stereo audio outputs. Owners of HD Ready TVs will appreciate its on-board upscaling, but there are a few more tricks up its sleeve. It plays all versions of DiVX, including v.6 and video-on-demand, plus MP3 and JPEG files. Unusually, it won't play WMAs, which will disappoint devotees of that audio format. Other useful features include a lightning fast 100x search mode (piracy advert, your days are numbered), a three-stage zoom and Enhanced Picture Mode (EPM), which allows you to fiddle with the brightness and sharpness settings. It's backed up by Enhanced Audio Mode (EAM), which adds a 3D effect to stereo sound, plus the deck is compatible with Dolby Digital and DTS soundtracks. Your burgeoning collection of home-made discs is also in safe hands, as this machine will play every type of recordable DVD except DVD-RAM, plus CDs and SVCDs. Operating the SD-370E is a piece of cake. The remote's buttons are clearly arranged with all the crucial options placed where you'd expect them to be, plus the deck reacts to commands quickly. Toshiba's user interface isn't the most sophisticated in the world, but it looks nice and is logically structured. The Toshiba produces excellent picture quality when hooked up to our 42in plasma test TV. 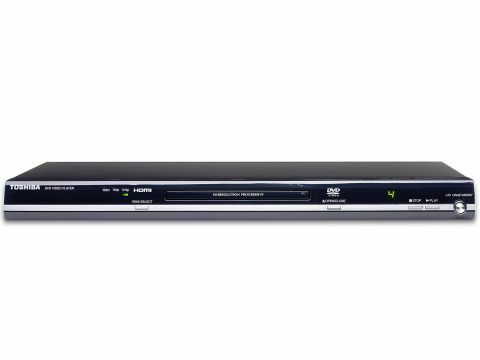 With King Kong in the disc tray and the HDMI set to 576p, images possess a clarity and cleanness that you don't expect from a DVD player at this price. Colour reproduction is the thing that first jumps out. Skull Island's earthy colours are brought to life with strong saturation and competent handling of tonal gradation. It's also a dab hand with areas that need subtle treatment, such as Naomi Watts' fair skin, which looks utterly convincing. Even without the upscaling engaged, detail levels are also high. It's best demonstrated by the scene where Kong battles a dinosaur - intricate CG textures such as Kong's fur or the dinosaur's weathered skin are clearly visible during slow-moving shots and the surrounding scenery looks sharp and punchy. Switch to 720p and the improvements aren't as pronounced as they are on more expensive decks, but they do make a difference. Fine detail looks fractionally sharper than the 576p setting and, on close inspection, areas of background detail seem less jittery too. And these excellent upscaled pictures aren't spoiled by grain or MPEG decoding artefacts either, so it's celebrations all round. Finally, the expansive contrast range contributes towards deep, dark blacks at one end of the colour spectrum and snappy whites at the other, giving images a solid, cinematic even via the RGB Scart and component video outputs. The absence of WMA playback and an iffy JPEG viewer aside, overall we're mightily impressed.